You won’t find another head lice removal treatment that combines the pesticide-free effectiveness of The Lice Lifters® Lice Solution Treatment with the hands-on expertise of our specially trained Lifticians. By the time you leave the Lice Lifters treatment center, you’ll be lice-free! And over the next two weeks, we’ll give you some simple homework that’s guaranteed to stop the lice cycle. 3 Steps to a Lice-Free Family! Section by section, we carefully go through your hair to check for nits, nymphs, and adult lice. If we don’t find any evidence, congratulations! You’re lice-free! If we DO find any nits or bugs,congratulations! Because you’re already a step closer to getting rid of them. Using our specially designed micro-grooved comb, we meticulously remove stubborn nits from the hair shaft until no more can be found. For clients with long hair, comb-outs generally take between an hour and an hour and a half. The process will go more quickly for clients with short hair. We apply the The Lice Lifters® Lice Solution Treatment, cover your head with a super-chic shower cap, and send you back to the comfort of your home to rinse out the solution. By the time you leave our treatment center, any remaining lice should already be dead — but we don’t mind being extra careful, which is why we’ll allow the solution to work until you get home. Using a natural lice treatment is an important feature of our services at Lice Lifters. Our DFW clients aren’t impressed with the chemicals and side effects that can come with over the counter treatments that don’t even fully eradicate head lice and nits. Only Lice Lifters offers a two-pronged treatment that uses a nontoxic, all-natural killing agent in conjunction with an intensive comb-out by our expert Lifticians. Our natural lice treatment is effective and kind to your child’s scalp. So you won’t have to worry about skin irritation or other negative side effects that come with harsher treatments. We’re so confident in our system, we guarantee our natural lice removal service. After your successful lice removal treatment, we’re counting on you to follow our instructions and complete some simple follow-up steps at home. We guarantee our results for a full month after your visit, as long as you’ve followed our easy after-care instructions, purchased the recommended products, and had all members of the family checked and treated at Lice Lifters. 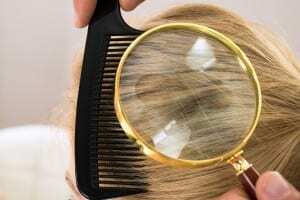 Results will NOT be guaranteed if the entire family is not checked and treated by Lice Lifters or if the recommended after-care regimen is not followed precisely. For more information regarding our treatments, contact Lice Lifters today! Call 972-805-1308 to make your appointment with us!